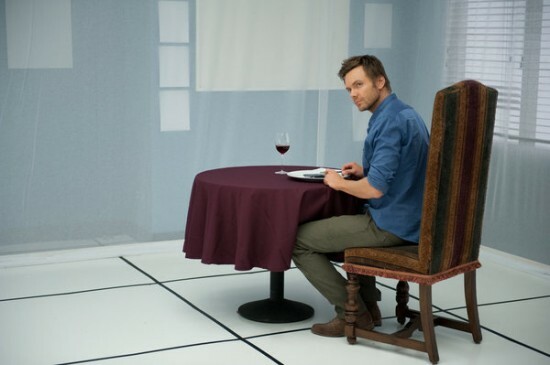 Joel McHale in "Biology 101," the first episode of Community's third season. Photo courtesy of daemonstv.com. While watching "Biology 101," Community's third-season premiere, I found myself laughing hysterically. This episode was one of the show's sharpest, funniest half-hours, featuring some pretty hilarious gags ranging from a sophisticated running joke about the differences between British and American television to the sheer physical comedy of watching John Goodman's Vice Dean Laybourne (head of the inherently funny Air Conditioning Repair Annex) using his girth to intimidate Dean Pelton (Jim Rash). After I'd finished watching the episode, however, I realized that, despite the many very funny moments, this was a dark, dark episode of Community, possibly darker than last season's melancholy standouts "Mixology Certification" and "Abed's Uncontrollable Christmas." The darkness of the episode stemmed largely from its exploration of Jeff's innermost depths. While the ensemble as a whole was very strong - Danny Pudi's Abed in particular had some stand-out moments - this half-hour was about Jeff Winger, and Joel McHale did a great job with the character. The show has always been, to some extent, the story of this shallow, self-centered character who learns things about himself through the rest of the study group, and that idea was at the forefront of "Biology 101." The difference between this episode and previous Jeff-learns-a-lesson episodes (such as last season's "Accounting for Lawyers") is that this episode doesn't let Jeff learn an easy lesson and go on with his life; he is forced to really look at himself, deep down into his core, and realize that he doesn't like what he sees. This moment of realization comes during a parody of the enigmatic finale of 2001: A Space Odyssey that doesn't feel like a parody in the way the show has done parody before. The scene is funny, but when you look more closely it's also very serious, very much the story of a man who is only now realizing how little he has in his life. According to creator Dan Harmon, this year Jeff "will try to change himself in ways that only prove the bad things about himself... He's a narcissist and a solipsist. His decision to start being a human being is going to be really hard for him." The show started to go darker last season, as certain episodes (such as the aforementioned "Mixology Certification" and "Abed's Uncontrollable Christmas," in addition to the excellent "Paradigms of Human Memory," among many others) began to show the cracks in the characters' seemingly happy exteriors. This episode took it further, and many of the funniest jokes included very dark elements, the best of which was the moment when the characters of Cougarton Abbey, a fake British series upon which Cougartown is supposedly based, all poisoned themselves with hemlock in the final episode. I for one am excited to see Community take a darker turn this season. Much of the best comedy is mined from pain, disillusionment and self-loathing, and I'm sure this wildly inventive show can do wonderful things with this new darkness. But enough about death and despair. As I said before, "Biology 101" was a very, very funny episode of Community. The running gag about Cougarton Abbey was fantastic, as was Abed's discovery of the extremely long running British sci-fi series Inspector Spacetime. (Can we have a David Tennant cameo? Please, Dan Harmon, please?) John Goodman was magnificent as Vice Dean Laybourne, and the revelation that Greendale's Air Conditioning Repair Annex provides eighty percent of the school's budget was great, and allowed for Dean Pelton's lovely, self-referential line, "I just came by to tell everyone that this year isn't gonna be that different, with the notable exception we won't really have any money." And the inspired Glee-style number that opened the episode was very funny and short enough that it didn't take up too much of the show's running time. Plus, that opening burst of sunshine and rainbows was an excellent contrast to the darker undertone that pervaded the rest of the episode. Abed and Troy moving in together is a promising development, particularly since Annie will, at some point, be moving in with them. Britta's announcement that she wants to major in psychology is sure to provide some great comedic fodder, and the rest of the cast's reactions to her desire to become a therapist were priceless. Also, Omar Little! As a biology teacher who is also an ex-con! YES! I think that Chang as a security guard could be a great development, as long as he doesn't get overused. A little Chang goes a long way. Harmon has also said that Jeff and Annie's relationship is going to go in a romantic direction this year. I have mixed feelings about this. On the one hand, the two actors have great chemistry, and Annie is the one person who can consistently make Jeff think about his actions. On the other hand, she's still 20. The high-pitched whining sound that Abed made when he found out that Cougartown wasn't coming back until midseason (and again at the gruesome end of Cougarton Abbey) was amazing, and also recalled Troy's screaming in "Paradigms of Human Memory." Loved the shot of Chang just nonchalantly walking around carrying a ham. Chevy Chase did a great job in this episode as a penitent Pierce, who was willing to be the villain just because Jeff needed someone to. "We have plenty of linens. We mainly want the things." "You are the opposite of Batman." "You could have lived the rest of your life in blissful ignorance and died a happy pansexual imp."